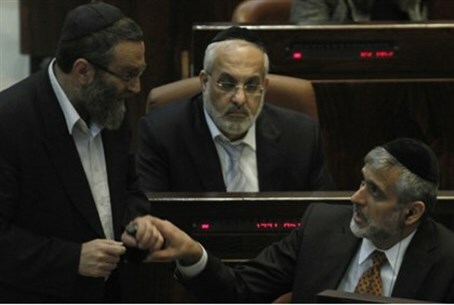 The Knesset’s hareidi parties are trying to decide on one candidate who they will support in the presidential vote. With the presidential election being just a week away, the Knesset’s hareidi parties, Shas and United Torah Judaism, are trying to decide on one candidate who they will support in the vote. The parties’ rabbis are set to decide next week who will be the lucky candidate to receive the support of both parties. The main question facing the hareidim is whether to “exact revenge” on Prime Minister Binyamin Netanyahu for leaving them out of the coalition by voting for MK Reuven Rivlin. Netanyahu, while officially declaring support for Rivlin last week, had tried to do anything possible to prevent Rivlin from being elected due to the past bad blood between them. Another possibility for the hareidim is to embarrass the Likud, long considered an ally of the hareidim, by supporting the Labor party’s candidate, MK Binyamin Ben-Eliezer, or former Knesset Speaker Dalia Itzik. Meanwhile, Foreign Minister Avigdor Liberman (Yisrael Beytenu) has already said he would not support Rivlin, but announced that he would not force the members of his party to vote for any particular candidate. Liberman warned Monday against electing Rivlin as president and reminded an audience of students that Rivlin did not behave as expected when it came to sanctions against Azmi Bishara, who was discovered to have aided Hezbollah during the Second Lebanon War. "I always try to be clear,” Liberman said. “I do not run away from reality and I provide answers. I made clear that I would not vote for Rivlin. I did not support him when he ran against Peres. I told him that I would not support him, even if he was the favorite. Meanwhile, MK Shelly Yechimovich (Labor) announced on Monday that, contrary to her party’s stance, she would vote for Rivlin and not for Ben-Eliezer. “He is a magnificent democrat. I do not have to guess how he will behave as president,” Yechimovich said of Rivlin.